"Shaking houses out of his sleeve,"
It always delighted me when Jack Howe, Frank Lloyd Wright's right-hand in the draughting room, or Wes Peters, son-in-law and Wright's engineer, would talk about Wright "shaking houses out of his sleeve." They were constantly amazed at how easily Wright could find the right house for each client and site. I, too, was amazed at Wright's facility in solving design problems and, like Howe and Peters, didn't quite understand how he did it. I do now. To understand this, we must explore the stages of Wright's architectural career as he moves from Victorian architecture to Prairie, rejects Prairie and develops Usonian architecture as his true expression of a "Democratic American Architecture." The great "why" of Wright's life, the why of his life's struggle to create a "Democratic American Architecture," is "Why become an architect?" The first answer is visual; and with Wright it was being surrounded by pictures of great architecture, placed around him by his mother Anna. The second element of this why is verbal/factual. The answer, to Frank Lincoln, later Frank Lloyd, Wright, was "Because Architecture is the Mother of all the Arts." Please note, despite my book editors who attempted to change it, Architecture, Mother, and Arts are all here capitalized, as any good German would do, but Wright was Welsh. He always capitalized those three words in this context, as well as "Democratic" and "American" and "Architecture" when he used them together. That in itself tells us something about his hierarchy of life's offerings. In his first architectural design period, Wright accepted the conventions of Victorian American life, which included live-in servants for even moderately well-off middle-class citizens. The thermos, invented by James Dewar in 1892, had not yet helped urge the man-servant out of the house and into the factory where he could earn a sufficient wage to own his own home and thus emancipate the maid-servant from her domestic servitude. That had to await Henry Ford's extension of the concept of interchangeable parts, first significantly developed in the Remington rifle's interchangeable flintlock, into the idea of a continuous production line and thus the five-dollars-a-day wage. Wright foresaw the consequences of all this and moved to adjust to it. The elements of Wright's first designs are the givens of the late Victorian era in America. In the first, visual, stage Wright made his Victorian houses very picturesque. The second, verbal/factual, stage, the facts pertaining to the project are those of Victorian America. The live-in servant should not be seen, so there may be three entrances to a house, one at front for visitors and family, one at the rear for deliveries and servants, and one at the side, for those debarking from the carriage or for servants. 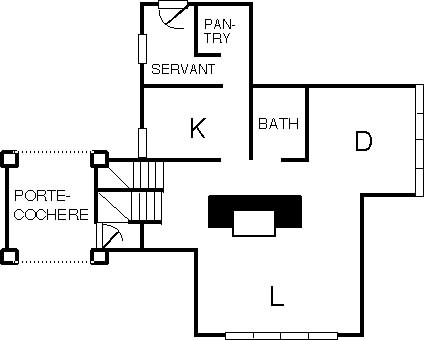 Wright followed a simple design schema in how to arrange spaces to suit the needs of this Victorian family. Divide the plan into quarters. 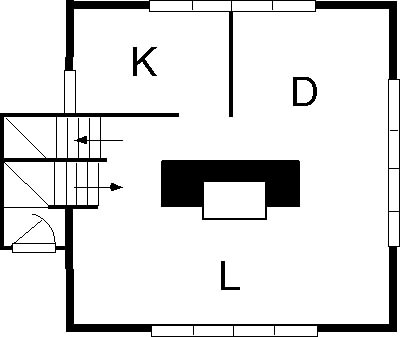 The lower-right quadrant, as a plan is usually drawn, is the traffic unit. It contains the entry, the hallway, stairs to upstairs and to the basement. This requires that the final rise to the second floor turn half-way down both left and right, one way to the servants at the rear of the house and the other to the main hall. The lower left quadrant was the library or, as it would soon be called, the living room. Next to it in the upper left is the formal dining room. This leaves the upper right for the kitchen and the servants. Notice that they are segregated while the family areas are all connected. Indeed, Wright's own first home is designed to this plan. Even in his earliest designs, however, Wright has placed the fireplace, the hearth, as close to the center of the design as possible, while other architects continue to place the fireplace in an outside wall. The hearth, around which the family would and should gather, will remain at the center of the plan throughout the architect's career. Nearing the turn of the century, Wright had proven himself a good architect in the academic tradition. Yet Victorian houses, with their servants, were anything but democratic. Wright rejected Victorian architecture and asked himself how he could move from this to a "Democratic American Architecture." His designs quickly veered away from obvious academic standards of architectural design into more linear and less decorative forms, the visual stage of this being change. He then began asking the ultimate question about his designs, "What if?" What if I changed this or that, could I reach something more American or more Democratic. Between the Bradley house in Kankakee (S.052) and the Willits house in Highland Park (S.054), we have a total transformation. If the structural differences in these two interests you, you will find them detailed in The Frank Lloyd Wright Companion. What is important here is that Wright combined all he had learned from his Froebel training and his early architectural practice into what has been called the Prairie era. Wright had been trained in Froebelian thought as a child. His aunts Nel and Jane understood the Froebelian Gifts and Occupations, as did most kindergarten teachers from 1855 on. His mother discovered them at the Centennial in Philadelphia in 1876, Wright's ninth year. Needless to say, the Froebel system is a complex interweaving of ideas that are to be presented sequentially in order to develop the skills needed to see not just the appearance of things but things as they are, to see not the container but the contained, not the things that are connected but that which connects them. Ms. Rubin goes on to show how each of these is intimately connected with crystallography as developed in the studies of Christian Weiss. The "what if" questioning of Wright's Victorian architecture led to experiments that brought about the conception of Prairie design and the first great era of organic architecture in his developing and extensive oeuvre. To have a new architecture that was truly American, not just designs derived from Europe or the conservative American Eastern Establishment, Wright had to create a new architecture in and of, and on, the Midwestern prairie, which was his home. That progress in Wright's design thinking led to an architecture that reflected the flat open spaces of the American Midwest, prairie America. Wright abstracted the prairie generically into low houses hugging the prairie, set on stylobate bases (which he had done, intuitively, as early as his first independent commission, the Winslow house in River Forest, S.024). He could fit three stories into a height equal to two Victorian floors, but he chose to limit himself to two, and cap it often with a hipped roof to lower the appearance of the structure further. Now Froebel comes into play, Friederich Froebel, whose Gifts and Occupations led a child full circle to an understanding of lines and solids, spaces and that which fills the space (remember Wright's "space within to be lived in" as the concept of the house, not its containing walls). It is the multiplicity of transformations that can be done within limited options that is important, as well as the gridded table on which Froebel Gifts were worked and played with. 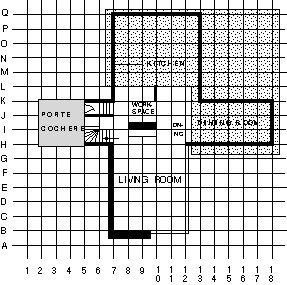 A grid, actually a unit system which creates the grid, underlies every design from the first Prairie structure through Wright's long career as an architect to the interlocking circles and circular segment units of his last-built residential design, the Norman and Aimee Lykes house (S.433), in Phoenix. Note here, of course, that this is about "shaking houses out of his sleeve,"not shaking designs, for to create a Democratic Architecture, we have to design Democratic housing first, places for a Democratic society to dwell. In the late seventies, I visited with Lloyd Wright, that is, Frank Lloyd Wright, Jr.,three times. The most memorable was a visit in his sunken living room in his Hollywood home. I had previously discussed with Lloyd doing for him what I had already done for his father, namely, create a catalog of his work. This was not long after an exhibition of Lloyd's work, and a nice catalog, much too undetailed for my likings, had been produced. Lloyd said that was enough, that I should pursue how his father did things. So, now I was seated opposite him, and I was explaining, as I understood it, how the grid came in to his father's work and why it was important. When I finished my exposition, he but rested his left elbow in his knee, raised his left forearm vertically, then straightened his right arm and rested his right forearm near its elbow on his left hand, his right arm extending a foot or more beyond the supporting left forearm and stated, simply, "and the cantilever." That was all he needed to say, for that took me finally into the mindset of Wright. The cantilever is the third dimension in Wrightian organic architecture. It is the first step out of the box, the Victorian mindset. Even the broad overhang of hipped roofs may be considered a small example of a cantilever. If you look at Wright's designs with an open mind, you will find cantilevers everywhere. What this did for me, however, was make me realize that Wright saw the spaces in which his clients would live before he thought of the plan that would accommodate their needs. Placing the design on a grid regularized the concept. First, it prevented many possible mistakes in design, but more importantly, it simplified the design. It was a form of standardizing parts in construction to reduce or eliminate unnecessary labor. The more I look at this one element of Wright's step from Victorian to Prairie architecture, the more I see, and the more I see it as a major element in the concept of Democratic Architecture. 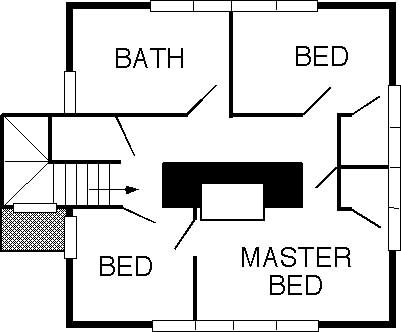 Wright, now, was able to change the floor plan to achieve many designs from simple concepts. The square plan stays with him, if in highly altered form, and the pinwheel enters. Let us consider each. 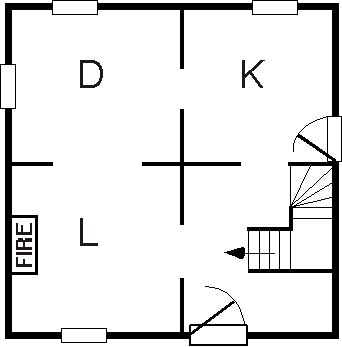 The square plan is revealed most clearly in his "Fireproof house for $5000," which was published in Ladies Home Journal (April 1907) and which produced designs for Stephen Hunt (S.138), G. C. Stockman, (S.139), Raymond Evans (S.140) and Edmund Brigham (S.184), and which can be said to have led also to the American System-Built Homes project, realized as Arthur Richards bungalows (S.203), and Arthur Richards two-story houses (S.204), for which there are more drawings in the Wright archives than any other project. In this, one whole half of the house becomes the living room, raising the importance of that family space above its Victorian value. The traffic area is now a small protuberance, half in and half out of the house, almost like the tail of a pollywog. The ground floor is several steps above street level. The other basic plan is the pinwheel, a standard Froebel geometry, and well represented in crystal forms as developed by Christian Weiss. I prefer, now, to consider the pinwheel as basic, and the cruciform as one way in which it can be treated, namely, as a pinwheel with inline axes. The pinwheel can have its arms offset in many ways and to many degrees, and can be, like crystals, right or left handed. It is highly variable and adjustable. 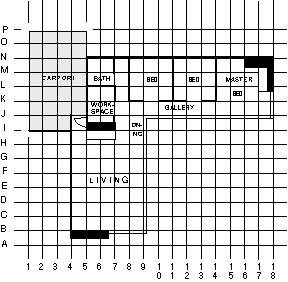 Wright created city block plans by placing houses at the corners of the block, each rotated 90° from its counterclockwise neighbor, to vary their relationship to the sites and each other. The basic idea remains: the largest arm of the pinwheel is the living room. Smaller arms, opposite each other as always to this point, were the entry and the formal dining room, and the kitchen was to the rear. However American this was, it was not yet Democratic. Prairie homes housed the rich and the well-to-do middle class, and did not help the lower-middle classes. So Wright moved on. He rejected Prairie, even as his acolytes and sycophants kept on in what they considered a "style." Wright's leaving his wife Catherine in Oak Park while he went off to Europe with his mistress, Mamah Borthwick Cheney, is but an outward expression of his inward turmoil. He had reached a zenith of which any other architect could but dream, yet he realized it was not what he wanted: it was not a Democratic architecture. In Europe Wright would produce the Wasmuth Portfolio, an elephant-sized set of drawings revealing, and closing off, this era of his architectural creativity. Interestingly, the plans in this presentation often fail to portray the structures exactly as built. Instead, the plans are altered, usually a shortening, widening, or narrowing of a space to make the drawing look more beautiful! How interesting, for the final stage in development of an idea, of asking "what if?" is visual, and Wright's celebration of his Prairie era work ends with this visual statement of his accomplishment. Now we come to the major transition in Wright's architectural design. Prairie architecture, American but not Democratic, was not enough. It still took too much of an architect's time, therefore too much of a client's money, to be democratic. The transition from what one must know to how to achieve it in practice, must be wrenching if it is to be transformative. In education this is when the teacher must let the student learn, must step back from the educational process, and let the student play with the "how" to implement, to use, the "what" the teacher has provided. Wright came back from Europe and threw himself into what became the American System-Built Homes for Arthur Richards in Milwaukee. The first name for this is instructive, "American Ready-Cut prefabricated housing." It was not truly "prefabricated" as we use the word today. The parts were precut at a factory and were shipped to the construction site ready for assembly. This, of course, would reduce costs considerably, and was the first stage, the "how "of how to achieve a Democratic, and thus American, architecture.' It's realization, however, may first be seen in a project for Sherman Booth in Glencoe, Illinois. Four houses, named for their first real residents, Charles Perry, Hollis Root, William Kier, and Daniel Kissam (S.188 - S.190 and S.192), share a common floor plan at the ground and upper levels. The houses all look different because the plans, or parts thereof, are flipped or rotated about the nearly square main floor, extended by veranda, and roofs changed from flat to hipped to gabled. This is the visual element, the second stage, of the how the Democratic could be achieved in Wright's American architecture. To keep alive and fed, Wright had moved to Spring Green, Wisconsin, where he created Taliesin on land in the valley of the Lloyd Joneses. He would accept more nonresidential commissions for the while, the Midway Gardens (S.180), the Imperial Hotel (S.194), Barnsdall Park (S.208 - S.210), but he kept working on the System-Built or Ready-Cut project until Arthur Richards took it up and with great fanfare offered it to the world, a world, sadly, into the throes of World War I. This was the first great disaster of Wright's career. After the Imperial Hotel, Wright found himself in California with his son Lloyd. Now two important things happen. The great Kanto earthquake hits Tokyo on September 1, 1923, and the Imperial, almost alone, stood secure and largely unscathed. What a confidence builder to a man battered by a world that disliked him for abandoning his first wife as well as Prairie architecture. It is also 1923 when Wright passes unequivocally into the last great period of his life, as he raises his most important "what if" to make the final breakthrough of his design career. Earlier Wright had generically abstracted the American prairie into low, ground-hugging houses. Now came the realization that each house could be individually abstracted from its site, not just visually differentiated by axial and other transformations. (For more on the process of abstraction, see the writings of Taliesin Fellow and Seattle architect Milton Stricker). Consider the four California block houses, Millard (S.214), Storer (S. 215), Samuel Freeman, (S.216), and Ennis (S.217). Here Wright is halfway through his career as he enters, by his own statement, the Usonian era. Truly, it is the final breakthrough. Four houses could hardly be more the same, yet hardly more different. Each uses the same materials, with one minor exception. This is the first stage of the factual element of "what if." Here is where Wright invented the textile block method of construction, which ties these first Usonian houses to his last Usonian automatics in a perfect circle. The idea was to lay concrete blocks three-inches thick, cast in molds, next to and on top of one another without visible mortar joints. A thin concrete, grouting, was poured into the edge reveals of these blocks. In all but the first of these houses, steel reinforcing rods were also placed in these edge reveals. Thus, the houses were structurally knit together. A double wall was common, with the space between providing insulation. Yet each is different because it fits and completes its site, abstracting the nature of that site into its design. This completes the visual element in the "what if "part of the cycle of progress in Wright's creative career, where one celebrates the achievement. Consider the visual differences. The Millard looking into a deep valley is three stories high, the entry at the middle level. The Storer paralleling its backdrop so as to face over Hollywood into Los Angeles, five half-stories high. The Samuel Freeman, opening to the street but having the bedrooms, with magnificent terrace that shields the indwellers from peeping eyes, below, and the Ennis, again by subtle use of half-, even quarter-, level changes stretched east to west nearly 250 feet to fit its hilly ridge. This is how they are different, spatially different, a complete visual transformation. Wright's celebration at having found a basis for a Democratic American Architecture was to be short-lived. 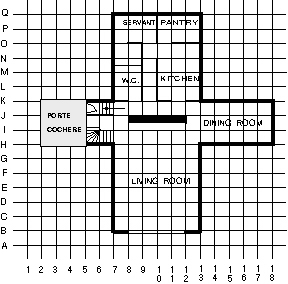 He would design the Arizona Biltmore Hotel and Cottages (S.221 and S.222), only to see, after he left the site, Albert McArthur, who had already enlarged Wright's block design from twelve-inch squares to 18 by 13 1/2 inches to save almost 50 percent in production costs, go on to put four floors where Wright would have had three, and three where Wright would have had two. This caused Wright to deny his part in the design, but the Gold Room and the Aztec Room give the lie to Wright's denial. Wright then started spending time in Arizona during the winters and working with Dr. Alexander Chandler on San Marcos-in-the-Desert and other projects employing the textile-block method of construction when the stock market crash of 1929 stopped this direction of architectural expression in Wright's work. The second great disaster hit not only the nation, but Wright in particular. This, misinterpreted by most of Wright's historians and critics, is why many consider the beginning of the Usonian era to be 1936, when Wright saw the first of his "new" Usonians built, the first residence for Herbert and Katherine Jacobs (S.234). One can understand why historians and critics place the start of Usonia in 1936, not only for the manifesto Wright wrote about what it constituted to be Usonian, but because these small post-Depression houses were so different from anything America had experienced as architecture. Not that the California block houses were not equally different. In 1936, Wright achieved the heretofore impossible; cheap and beautiful housing, Democratic American Architecture! The process involved further abstraction, which, now, could be applied as in California to any site. The first basic was to take the bedrooms down from a second floor and place them, too, on the ground. This formed one wing of the house, for this was the quiet part of living and had to be separated from the noisy part, the living room. Separate it with the traffic, kitchen now called workspace, and dining areas, placed as compactly as possible exactly between the living room and the bedrooms! How simple. START with a basic Prairie cruciform plan suitable for a family of four, plus servant. First alter the living room, giving it a full glass "windowall" to its long side. THEN reduce the kitchen, pantry and servant's space to a compact "workspace" suitable for preparation of the family's meals by the modern American woman. Eliminate the formal dining room, and place dining activities in a convenient place just outside the workspace where it will share space with the living area and be seemingly enlarged thereby. NEXT, bring all second-floor activities down to ground level, placing them along a gallery running from the workspace entry (so the housewife can watch at all times household activity while working in her space). This obviates the stairwell; the porte cochere is simplified into a carport, usually dramatically cantilevered. You achieve a Usonian house that is much more compact than was the Prairie ideal. It was also infinitely variable on a number of unit-modules to suit any site, any climate, and any size family. While from the previous presentation it may appear that by "site" is meant the physical geography of the land on which the structure is to be built, that would deny all the elements that Wright included in "site." While the basic Prairie and Usonian plans are the natural outgrowth of the flat Midwestern prairie, the individual structures from Usonia on are abstracted from many elements including local flora and geological formations, client wishes and needs, or even Wright's own egotistical need to have built a structure designed for another client and location but never constructed. To lead his apprentices to his concept of "nature" and that which is "organic" in nature, natural, he sent them out into the desert at Taliesin West to look at nature's geometry. This is the kindergarten of organic learning, but not the graduate school. The backdrop of Taliesin West is the McDowell mountains, an abstraction of which is the design theme for the structures in Scottsdale. If we look nearer the end of his design career, Wright's Guggenheim Museum configuration is an excellent example of designing to the site in terms of the need specified by the client. The gently sloping ramp forces the viewer to amble down from the top, where exhibits start, to the ground floor, where the exhibit ends by design, rather than get detracted as in most other museums where doors in every wall permit the viewer to ignore any logical sequencing of viewing. Wright loved the grain in wood and would choose woods for their beauty, using redwood in California as he used Tidewater cypress in the eastern United States. Wood was, however, only a substitute in exterior construction for masonry. He used wood between the central masonry core and the wing-ending piers, for economy at a time when economy was necessary. After the Great Depression and the Second World War, when brick again became available, Wright developed the all-masonry Usonian house. Then, to further reduce costs, he returned to concrete block and his textile block system of construction. Clients could manufacture the blocks at the site in what Wright now called Usonian Automatics. Gerald Tonkens (S.386), Toufic and Mildred Kalil (S.387), Elizabeth and William Tracy (S.389), Ted and Bette Pappas (S.392), all participated in this method of building their own homes. Wright then took this idea and back-designed it into the Prefabricated designs for Marshall Erdman (S.406 - S.412), which employed 4-by-16-foot Masonite Ridgeline siding decorated with horizontal battens to replace the masonry blocks, bringing full-circle Usonia from block to wood, back to block and again to wood. Wright was truly "shaking houses out of his sleeve," up to fifty designs a year, each different visually in transformations easily understood by someone familiar with Froebel Gifts and Occupations, yet each sharing common principles of spatial arrangement, each individually suited to its site through various forms of abstraction based upon a variety of information provided the architect such as the site plan or photographs of the site or a visit to the siteclimate and environmental conditions at the site and client-specified needs. What links, and differentiates, eras in Wright's design is abstraction from the site. It begins with the question of "why" build here, follows with "what" are the materials and conditions available for building and the expressed needs of the client, moves on to "How" can these elements be abstracted into a buildable structure, and closes with "what if" we alter this, or that, until a Democratic American Building emerges on the client's site. This is what Frank Lloyd Wright would call "Democratic American Architecture."